Batting stars: George Mitterwald was 2-for-4. Pitching star: Dave Boswell pitched a complete game, giving up one run on three hits and eight walks (!) and striking out four. Opposition stars: Fritz Peterson pitched seven innings, giving up two runs (one earned) on six hits and a walk and striking out two. Ex-Twin Jimmie Hall was 1-for-2 with two walks. The game: There was no score, and really not much of a threat to score, until the bottom of the fifth. Tom Tresh led off with a walk, went to second on a ground out, took third on a wild pitch, and scored on Horace Clarke's sacrifice fly to put the Yankees up 1-0. The lead didn't last long. In the sixth, Boswell helped his own cause (one of the sad things about the DH is that in the American League we no longer get to say a pitcher "helped his own cause") with a one-out double. Cesar Tovar brought him home with a single-plus-error to tie the score. Leo Cardenas' bunt single put men on first and third, and Harmon Killebrew brought home the lead run with a sacrifice fly. The Twins led 2-1. That's where the score stayed. Only once did a team advance a man as far as second base the rest of the game. That came in the seventh, when Yankee catcher Frank Fernandez doubled with two out. Tresh walked, but Jim Lyttle struck out to end the inning. WP: Boswell (5-5). LP: Peterson (6-5). S: None. The game: Tovar started this game in center field, with Bob Allison in left. Ted Uhlaender came in for defense in the seventh, with Tovar moving to left. Frank Quilici started at second base, with Rick Renick at third. Rod Carew came in for defense in the seventh, with Quilici moving to third. Mitterwald caught, with Johnny Roseboro given the day off. I hadn't really thought about it much, but another thing deep bullpens and short benches has done is make late-inning defensive changes much less common. They still happen, but not nearly with the frequency that they used to. So far, at least, in 1969, Billy Martin routinely put Quilici at third and Tovar in left in the late innings when the Twins were ahead, usually replacing Graig Nettles in left and Rich Reese in the infield (Killebrew would move from third to first). I wonder if Martin thought Killebrew was a superior defensive first baseman or if he just was reluctant to take his bat out of the lineup, no matter what the score was. 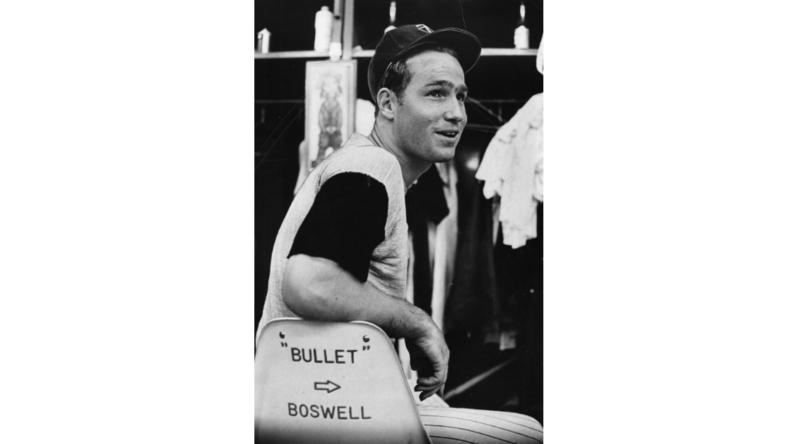 Boswell was never known for great control--his career record is 4.1 walks per nine innings. Eight was a little extreme, obviously. Interestingly, he only once walked more than one in an inning in this game, and that was they fifth when the Yankees scored their lone run. 1969 was actually his best year for walks per nine, at 3.5. The Twins had now scored fifteen runs in their last nine games. They won three of them. This was Hall's lone season with the Yankees, and it wasn't even a full season--he was traded to the Cubs in September. He would struggle through the 1970 season, then he was done. Fritz Peterson's given name is Fred Ingles Peterson. Just in case you were wondering. Record: The Twins were 22-16, one game ahead of Oakland in the American League West, pending the playing of the second game of the doubleheader.